Rupture in coolant return line, due to excessive erosion thinning, caused 8 days shutdown. To avoid such incidents, it was decided to comprehensively evaluate Integrity of plant pipelines through a systematic approach to ensure their maximum availability at desired Reliability level. As first step towards building a dependable Risk Based Inspection Program, a plan was made for 'Critical Evaluation' of all pipelines with respect to Safety, Environment, Production & Past History. 3565 pipelines were reviewed individually and 1871 pipelines ( 52 % ) were identified 'High Critical'. Thickness survey of all 'High Critical' pipelines will be completed this year. This is an attempt to optimize our inspection activities in a scientific approach, to put guidelines for selection of pipelines according to their criticality in either one or more of the safety, production, product quality or pipeline reliability factors. In 1 EG, the 12'' Dia. Coolant Return line of EO Reactor 1101B, ruptured, on 02.12.2000, due to excessive erosion thinning. This caused more than 8 days of unplanned shutdown for 1EG plant. To avoid such incidents in future, it was decided to comprehensively evaluate the integrity of all plant pipelines through a systemic approach so as to ensure their maximum availability at the desired reliability level. As a first step, SABIC affiliates were contacted to find out practices followed by them and to share their experiences. Review of feedback received indicated, in almost all cases - No study has been done so far. Only pipelines with Problem / Failure history are being monitored at present. In isolated cases, it also included Process Licensor recommendations / lines with Critical process fluid ( eg. Butane - which produces a Vapour Cloud, if leaked to atmosphere ) are being monitored at present. This indicated that although SABIC affiliate companies carry out pipeline thickness surveys, the selection of pipelines does not depend on any scientific study or clear cut justifiable guidelines. In most of the cases this is based on previous history i.e. Problem lines. But This is a "REACTIVE ACTION" as it does not have any scope for improvement of "PLANT RELIABILITY". "SCIENTIFICALLY ESTABLISHED CRITICALITY CLASSIFICATION AS A FIRST STEP TOWARDS BUILDING A DEPENDABLE RISK BASED INSPECTION / MAINTENANCE PROGRAM IN SHARQ". This was the reason that SHARQ took initiative to review & classify pipelines as per their CRITICALITY, after discussing with PLANT / ENGINEERING to firm up the guidelines. As effective programs can not be made for every pipeline in the field considering Cost, Efforts & Time involved, it was decided to review all pipelines in Plants and classify them as per their Criticality. A plan was made for 'CRITICAL EVALUATION' of all pipelines with respect to SAFETY, ENVIRONMENT, PRODUCTIONS (QUANTITY & QUALITY) & PAST HISTORY. It was felt that such scientifically established "CRITICALITY CLASSIFICATION" is of prime necessity and would be first step towards building a dependable RISK BASED INSPECTION / MAINTENANCE PROGRAM and will have great impact on the proper action plans. A team was formed with Reliability - Chief Engineer ( Inspection ) as Group Leader, consisting members from Plant Operation, Process Engineering & Inspection Group to carry out critical review of pipelines. A set of Checklists for identifying Production / Safety Criticality and Failure Probability of Equipment was already available. Each checklist contained a set of 10 Questions. These Checklists were critically reviewed and a set of most appropriate questions were selected and modified to suit the objective. 12 questions representing Safety, Failure Probability and Past History, were prepared to finalize the Check list. As majority of pipelines will fall under 'Production Critical' - this category will not be considered while deciding lines classification / frequency of Inspection. Pipelines below 2" size, will be reviewed on the basis of their service ( eg. - TEAL, Catalyst, Air, Nitrogen etc. ) or if they have a history of problem / failures. Process Fluid was also considered for selection, eg. TEAL lines were taken up based on criticality of process medium. Water lines, specially Sea Water, Cooling Water & Chilled Water lines were considered & reviewed. Pipelines with 2 Phase flow were considered and reviewed. Stainless Steel lines, specially those in Cycle Gas, Steam Condensate service were also considered & reviewed. Pipelines subjected to higher than specified fluid velocity were considered & reviewed. Pipelines in corrosive service were considered & reviewed. Pipelines which have history of corrosion / problem / leak were considered & reviewed. It was decided to use latest updated P&ID of respective plants, as a reference document for selection and review of pipelines. This way all pipelines could be traced from start to end and were marked. Also it ensured that no pipeline has been missed by mistake. The methodology concentrated mainly in answering many questions about pipelines in all aspects, where the questionnaire was designed in such a way that the results will enable the reviewers to decide whether the pipeline (as a whole) is High Critical / Medium Critical / Low Critical or Non Critical. Every individual pipeline was thoroughly reviewed against each question and debated, if required, till a consensus decision / agreement was reached. 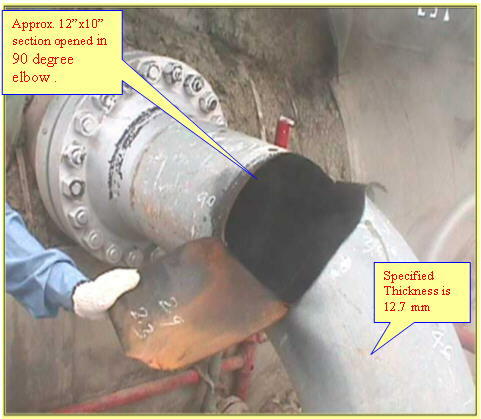 Final decision was noted down and after completion of complete questionaire, criticality of that pipeline was identified and documented accordingly. If answer of any question was 'Yes', then only the line was further reviewed to ascertain its Criticality level. Highest criticality rating attained by the lines was considered as its 'Final Criticality'. This activity was taken up on full time basis with the team members exclusively dedicated for this job. Sample copy of Check list used for this purpose is enclosed. ( Attachment - 1). For these pipelines, all available and non-available kinds of maintenance, operation care would be exercised. Such application would minimize drastically the chances of sudden unplanned failures and consequently minimize the losses and chances for safety accidents and incidents. Pipelines that lie in these categories shall mainly be under very close condition monitoring programs, wherever possible. It should also include all NDT practices as well as condition monitoring practices that are usually observed by operation (flow, sound, pressure, efficiency, visual appearance.. etc.). In summary, the ideal case for the Medium & Low Critical pipelines is to be under condition-based maintenance and not time-based maintenance. These pipelines will be under (Run-to-Fail) inspection philosophy. However, reviewers must be very careful in deciding whether a pipeline is non-critical since this decision will result in ultimately dropping the pipeline from regular scheduled monitoring programs. 3565 Pipelines were reviewed individually and 1871 pipelines (52%) were identified as 'High Critical'. A comprehensive thickness schedule is prepared and a dedicated team has been put to carry out thickness survey of all 'High Critical Pipelines'. To begin with, all 'High Critical Pipelines' identified, are being thickness surveyed and our Target is to complete this activity by December, 2003. A Master Format has been designed, encompassing all relevant details ( viz. line location, design & operating pressure / temperature, nominal thickness, corrosion allowance, material of construction, date of thickness measurement, minimum / maximum measured thickness values etc ) for each High Critical Pipeline are being entered in the format. Upon completion, all these details will also be put on SHARQ LAN Network for information & reference to all. SHARQ has already purchased an Inspection Data Management Software 'UltraPIPE' ( by M/s SOS & marketed by M/s Krautkramer, Germany ). All High Critical Pipeline details are being entered into UltraPIPE for the purpose of future scheduling / follow up by the software. Next step is to review all measured thickness results and devise guidelines to fix inspection frequency for all these pipelines based on their history, corrosion rate and applicable code. Similar activity is planned for Medium & Low Critical pipelines, in future. Based on the evaluation, an Inspection & Maintenance programs (PM & PdM) can be developed, which if utilized effectively would greatly contribute to achieve these ultimate objectives. The above discussion reflects our efforts in trying to come-up with an acceptable way in defining the criticality condition. It is of course known that a margin of uncertainty would exist which may require us to make another review as we get more confidence of our approach and after we let the program run for some time and test its results. It is known that this is not the most ideal case to review only the pipeline as a whole and treat all its parts and component equally but it is believed that the subject proposal is the right step towards applying typical RCM activity in the near future. The practice can be considered as the first filtration process where a lot of non critical pipelines can be identified and consequently dropped. On the other hand, many critical pipelines not monitored till now, can be identified and put under regular monitoring schedule. Nevertheless, it is known that more ideas, corrections, improvement can be added to it. But commenting on such proposal should not stop us from proceeding ahead until we reach the real review period where all plants pipelines will be analyzed closely. The result can be expressed in many ways other than the way mentioned here but the background work would always be the same and the results will be very useful in future to optimize SHARQ inspection / maintenance activities. The authors would like to thank SHARQ Management to support this activity and permission to publish this paper.